Who is Mademoiselle mange à Sydney? Mademoiselle is a French frog who grew up in France. Her second love is eating (Monsieur – her husband – comes first) and she’s obsessed with anything that’s food related: baking cakes, making up recipes, eating out, and buying kitchen appliances (staring at cake moulds and pans for hours is also OK). 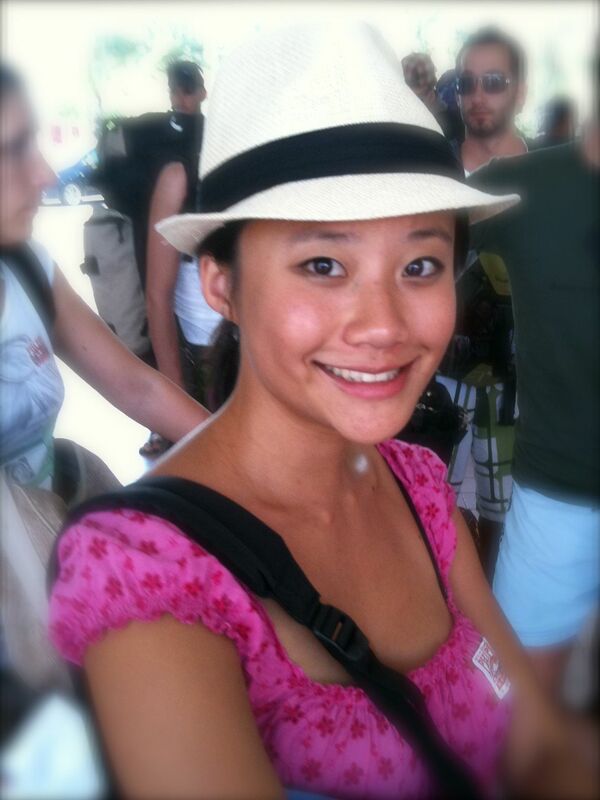 Mademoiselleinsydney.com is her food blog. 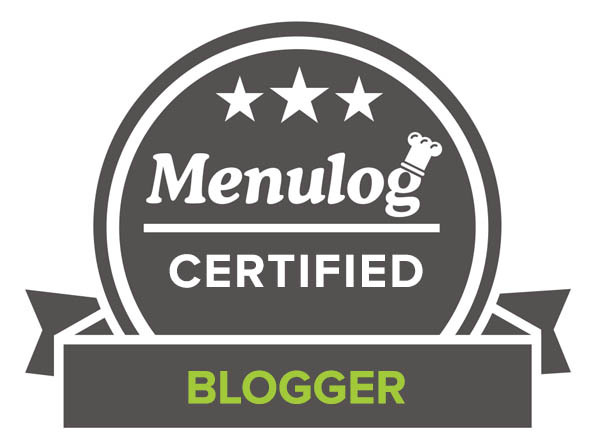 When Uru was looking for food bloggers to guest post on Go Bake Yourself and I put my hand up, I thought about cooking Indian food… and then I thought heck… this won’t sound genuine! So instead, I chose to bake something French using Indian ingredients: Spices J. Today, I’m sharing my recipe for “pain d’épices”, or French spiced bread. It is something we usually have for Christmas, but most of the time you can buy it all year round in supermarkets (pain d’épices is commercially produced as the demand is high.) I recall I didn’t like it when a kid as the spices were too strong… but growing up, my tastebuds changed… Ever since, my love for pain d’épices grew stronger. The thing is, I couldn’t seem to find any here in Australia… that’s pretty much how I started to make my own! Though Pain d’épices is called “pain” as it was a sourdough type of bread originally, most if not all of the recipes call for self-raising flour or baking powder nowadays. What’s fantastic about pain d’épices is that it’s good for you because it’s mostly made with honey, not sugar 😉 For a Pain d’épices to be called Pain d’épices au miel (honey spice bread), it has to be sugared with honey only. Step 3: mix the flour, baking powder and spices together. 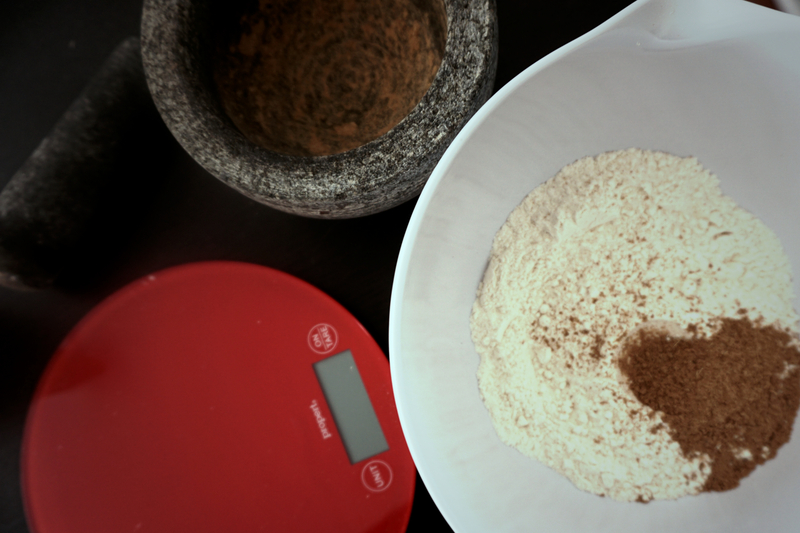 Step 4: Break the egg in the flour+spice mix and gently mix it all. 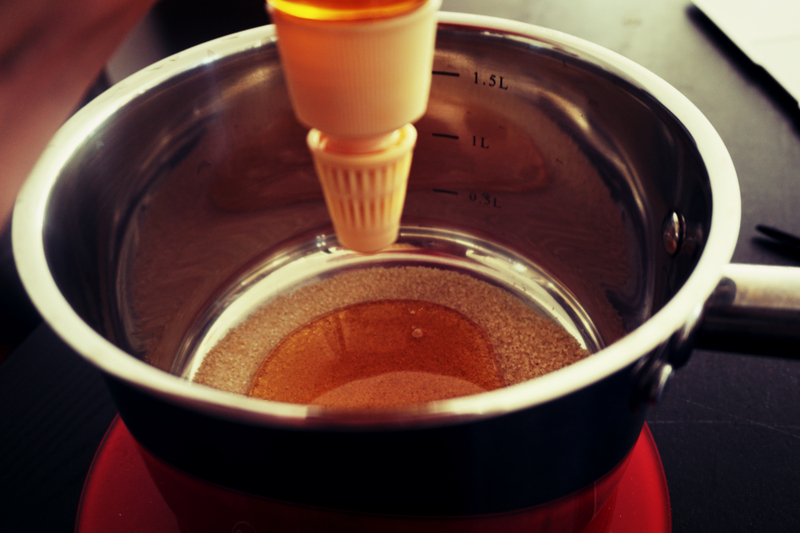 Step 6: Slowly pour the honey and sugar mixture (it should be cooler) and mix the whole lot. Step 7: Pour the mixture in a lined mould (I use baking paper, but you can also line your mould with butter first, and dust flour on top) and bake for 30 minutes at 180°C. According to the English version of Wikipedia, pain d’épices is French, but according to the French version of Wikipedia, it’s actually Chinese. Now who’s lost in translation? 😉 Pain d’épices is best the day after it’s made as it allows some time for the spices to become more fragrant. What a delicious guest post, great combo of flavors too. 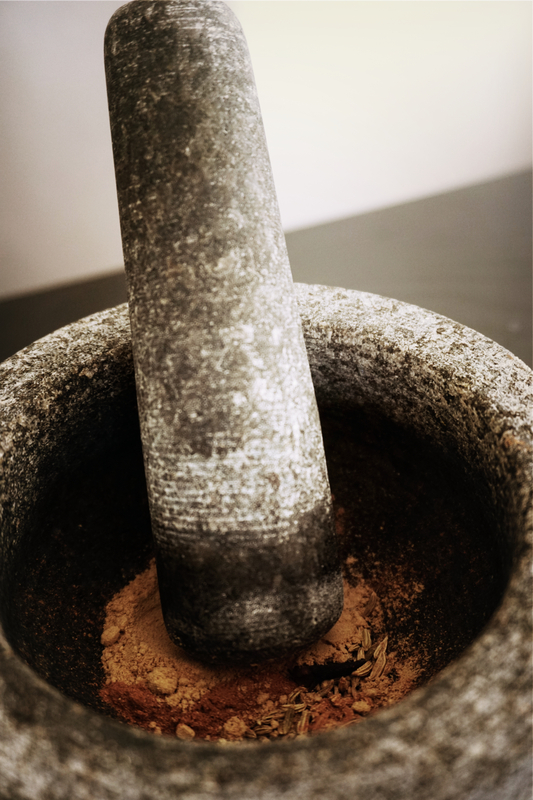 I love the photo of a mortar and pestle. I never think to grind dessert spices in one… but why not. It’s a delicious looking sweet treat..
A slice of this is a great way to start or end the day. I love this beautiful bread with spices and honey…. 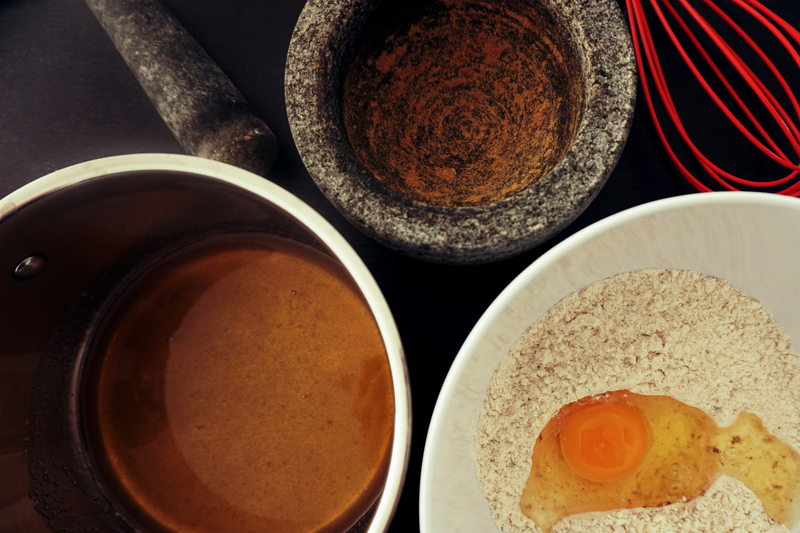 Delighted to have a recipe for Pain d’épice – I’ve tasted it a few times on holiday and am slightly adicted to it. Hi Mademoiselle, what a wonderful quick bread, sounds full of flavor, I bet your kitchen smells wonderful! Sometimes I truly wish I could still eat bread! This sounds like the perfect sweet bread for the holidays! Love the spices. How interesting with the fennel seeds! Wonderful blog post, dearies! What an interesting twist to Indian spices! Pleased to meet you too. It is a bit confusing, so I wonder how much discrepancy there is between wikipedia pages for Pain d’épices in different languages! ooh.love quick breads! so easy and fuss free yet so delicious. I bet this pain depices smells and taste fantastic! Good luck with your exams CCU! What a marvelous mixture of spices! I bet this bread smells amazing while it’s baking! Oh but I love this recipe! I just bought some beautiful paper moulds and I’d love to bake this for Christmas sharing! I am intrigued with these spices. Very festive! Sounds great, love fresh bread! The name of the bread is not easy for me to pronounce but I love the outcome. The cake is yum to the maximum. A spicy quick bread? Just up my alley! Fun recipe fun post — thanks so much. That looks delicious. Perfect for the holidays! I can just imagine how good it smells and tastes. Great guest post, Mademoiselle. ohh la la – tres bien 🙂 I failed French for my HSC (le oops) so that’s about the extent of mon Francais. 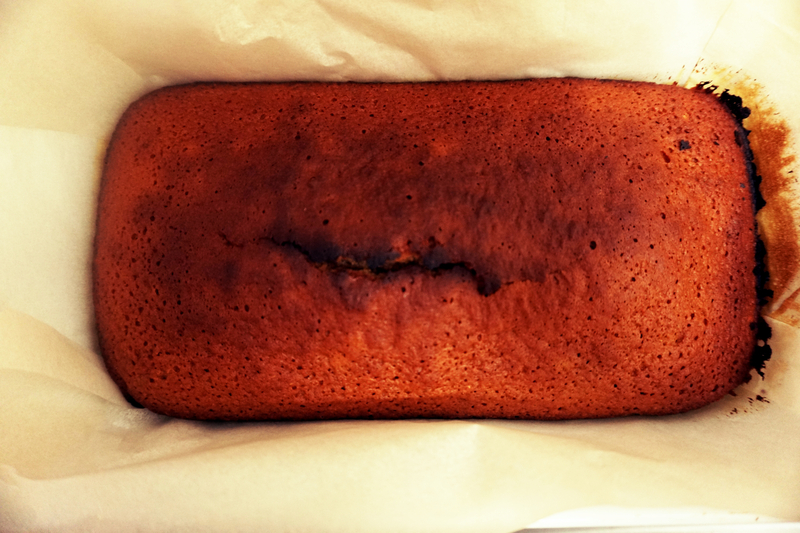 This bake looks incredible – am loving the unusual spice blend. ha ha ha, French isn’t really the most useful language of all to learn when you live in Australia! I love this beautiful quick bread! It looks delicious and seems quite easy to prepare. That looks so good and I love the guest post! I love the fennel seeds, clove and ginger used..wow! You are too funny Uru..I love how you write!! G’day Great guest blog post and I can almost smell the pain d’épices from here! Love the smell of fresh bread!